What is Esty about? A comprehensive review. There is a surge in the number of people searching online for ways to use their skills to make money. Being able to work from the comfort of ones home is convenient as moms and dads get to spend more time with their kids, family and friends. Plus they save on day care. 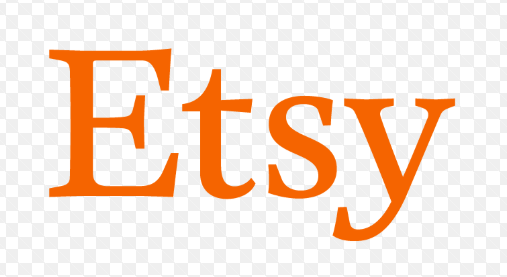 Esty is all about providing a platform where people can buy and sell home made items. This is an artisan market place where you can find unique handmade items for very affordable prices. Are you an artisan and are you in search of a place to sell your craft? If yes, you are at the right place. Today I will be writing a review of Esty, one of the few market places that focuses on artisan and vintage goods. Esty is a unique market place for vintage items and handmade goods. At Esty, you can sell and/or buy unique items. There are thousands of registered sellers and millions of buyers. Opening a shop on Esty is free and it only cost $ 0.20 to list an item every month. After and item is listed, it has four months to be sold before it is taken down. 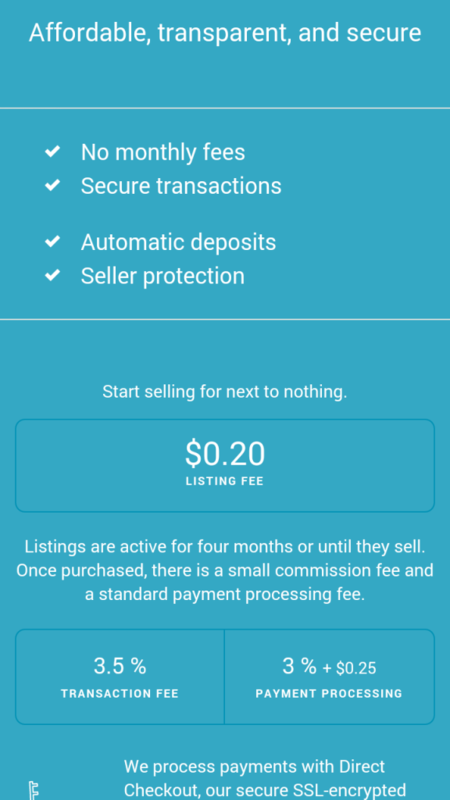 The user interface is very user friendly for both buyers and sellers. Tabs are color coded and very responsive. If your item is bought, Esty’s encrypted payment software make sure you are protected. All you need to do is ship the item to the buyer. Esty even offers the option of printing discounted shipping labels straight from your Esty shop. Esty charges a 3.5% transaction fee per sale which is very little when you think of the fact that there is no monthly fee for being a member. This fee is also very low compared eBay which takes about 10% fee for every sale. Once you have opened shop with Esty, you have a lot of tools at your disposal. Esty makes it easy to work from anywhere with the sell with Esty app. With this app, you can manage orders, respond to buyers and edit listings from anywhere. Esty offers promoted listings and free social media tools to help sellers reach a wide range of buyers within Esty and beyond. You can also buy and print discounted shipping labels in seconds right from your Esty account. Community and education is very important at Esty. You can reach support specialist by email or phone if you have any questions. You can also ask questions to teams and forum of sellers like you. Also available is a handbook for best sales practice which is updated regularly. 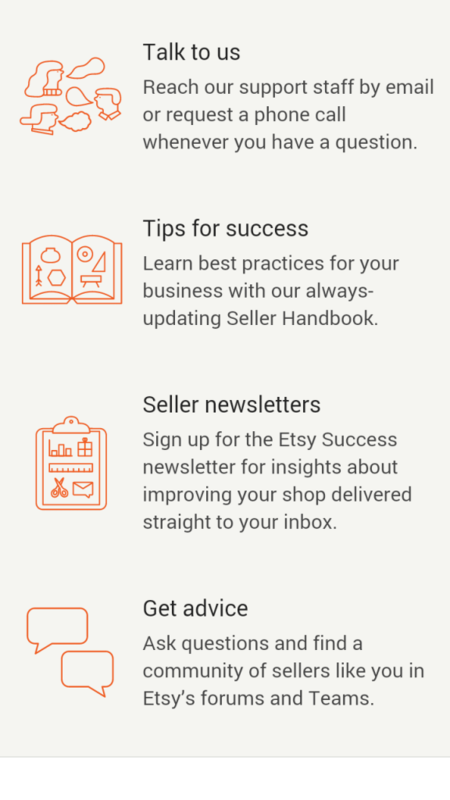 Subscription to the esty newsletter sends vital information about way to sell your products successfully right into your inbox. Esty has really thought of it all. They understand that some people need to grow even bigger and they offer tools to let them do just that. When you set up shop at Esty, you get a generic esty shop. However, some people wish to be unique and reach people out of esty’s network. To make this possible, you are provided with website building platform that allows you to build and tweak your site until you’re satisfied. This customized website is powered by your esty shop, meaning you can run both stores from your generic esty store because your inventory will sync automatically. 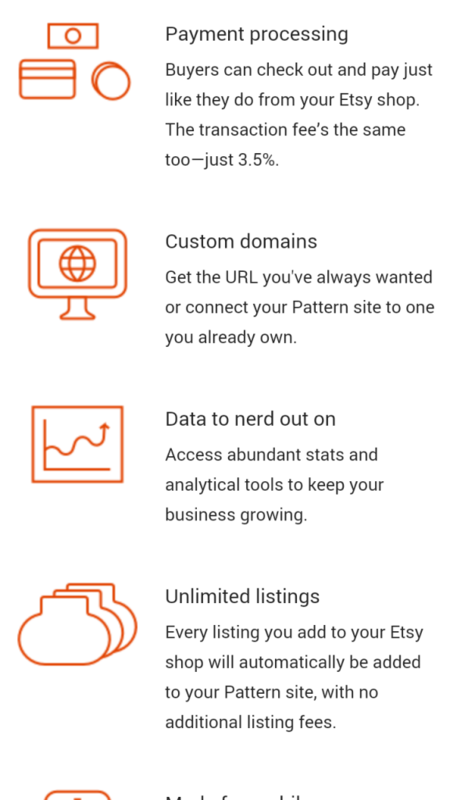 It is very amazing that you can get an url or connect your custom site to an already existing one. 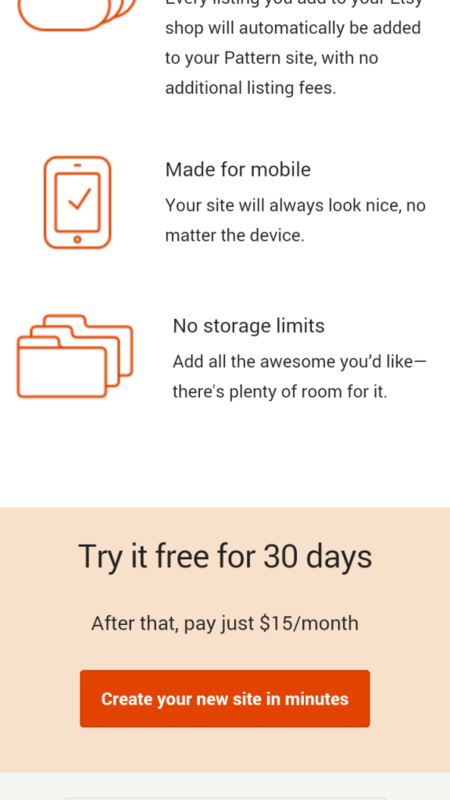 Pattern websites cost $15 a month after a month of free trial. You can also go whole sale with esty by enrolling in their program that allows you to sell to a variety of retailers. With this tool, you are bound to find among about 11000 retailers one who is interested in your products. Macy is one of the retaillers on esty’s list of thousands of retailers. 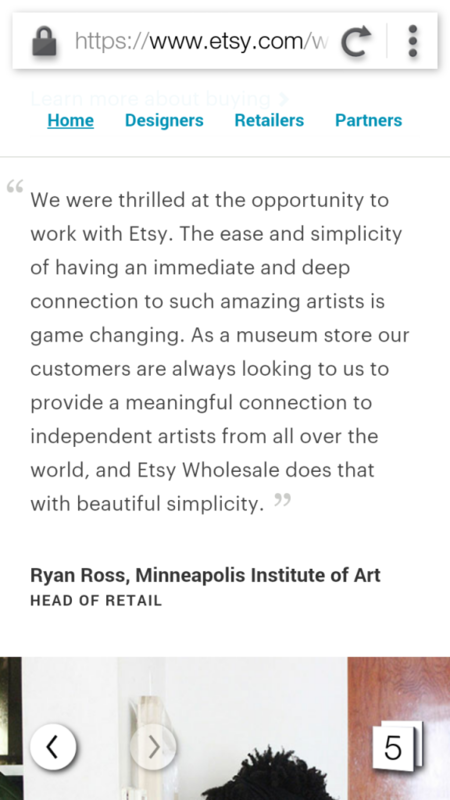 What are people saying about Esty? Many of sellers on esty are satisfied with the site which many say helped them build their passion for art and craft and helped them realize their dreams as sellers. Many people have been able to grow a business from a few crafts or art items to a full time whole sale business. No business is perfect however, and Esty is not an exception to this rule. Some sellers complain of being drop off Esty without notice especially when they come to an agreement to cancel a transaction with a client. Since esty is made up of millions of sellers, there’s always the chance that some sellers might not have the best customer service but esty does their best to protect both buyers and sellers. Furthermore, Esty has a stiff competition, eBay. eBay more popular and has a better conversion rate overall. However, eBay takes more from the seller in terms of fees. This is where Esty is better. What if I don’t have a product to sell? No problem, Esty is not for everyone. 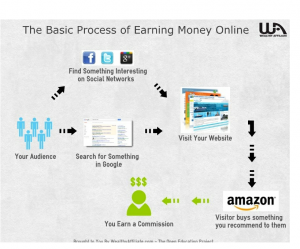 There are many ways to generate income online without actually owning a product. The most common one is called affiliate marketing. Affiliate marketing is the kind of business where you refer the products or services of another person for a cut when the product is sold. Say for example that you are passionate about sport cars and will like to recommend this product to the public, you can write blog posts about this product and publish it online for people to read. If someone goes through your site and reads this post and decides to buy the car, you get paid commission for referring this person. Many businesses have affiliate programs that pay good commission for referring people to their sites. Remember however that the purpose of affiliate marketing is to help people so only recommend products you believe are good. Click the link below to join my #1 recommendation and learn how to setup a website and build a business online. Check out my #1 recommendation for building a successful online business! Thanks for dropping by, please leave a comment and do not forget to share this post with friends and family. can i make money with esty?, can i sell my craft at esty com, esty art and craft market place, how can i join esty com, is esty a legitimate business?, is esty a scam?, is esty a secured market place?, is esty legit?, what is esty all about?, what is esty com?